The samples were taken from the Isfahan composting factory (ICF). ICF is located at the eastern parts of Isfahan city. About, 1000 tons of source-separated organic MSW deliver to the facility daily. Untreated leachate was stored in refrigerator at 4 C for the duration of experiment. Before being used in the system, leachate was diluted using municipal wastewater. The brief characteristics of raw and diluted leachate are summarized in [Table 1]. Influence of pH on COD removal is given in [Figure 1]. It can be seen that COD removal rate has an increasing trend by decrease of pH. The maximum removal of COD (43%) was achived in pH 3. Hence, pH of 3 considered optimum in the following. The added ferrous sulfate dosages in FS process were 2, 4, 8, and 12 mmol. In [Figure 2], it was observed that by increasing of ferrous sulfate dosages, the removal of COD and BOD increased. 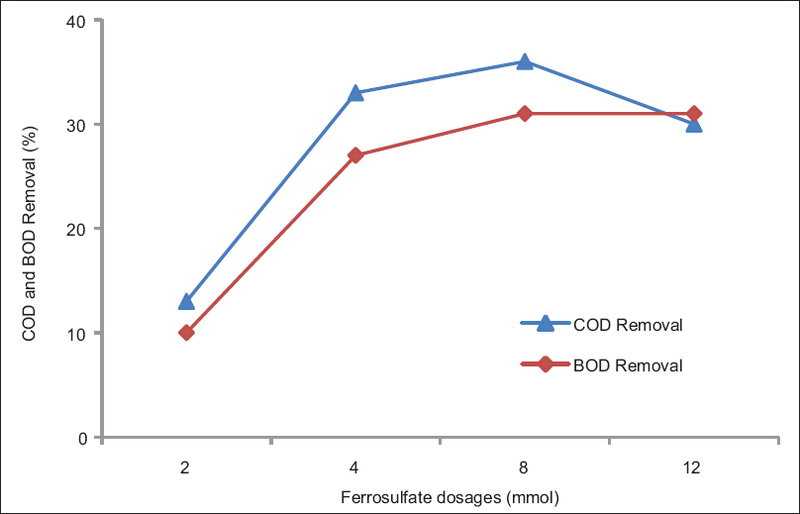 The maximum removal of COD and BOD was occurred in 8 mmol ferrous sulfate. 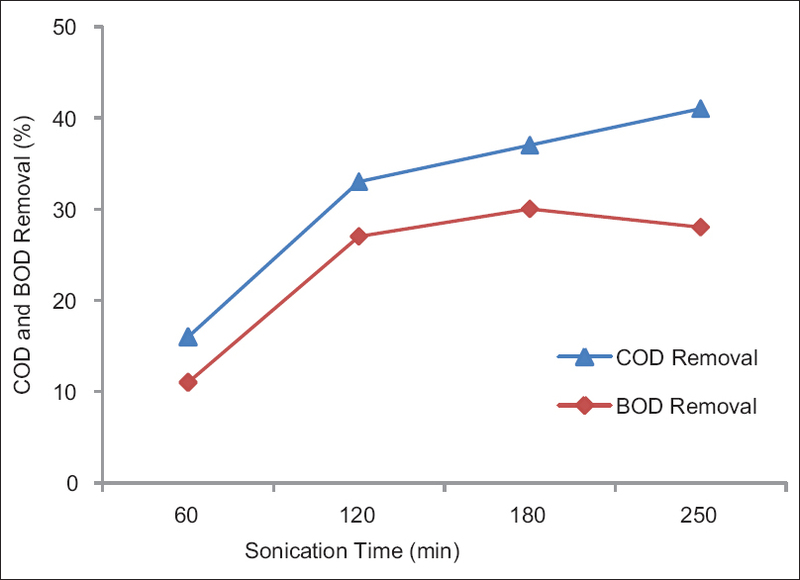 [Figure 3] illustrates the effect of sonication time (60, 120, 180, and 250 min) on the removal of COD and BOD. The experiments in this stage were carried out in the optimum ferrous sulfate dosage 8 mmol, power of 120 W, and pH of 9. It is clear that the COD and BOD removal increased as the time of sonication increased. Approximately 41% removal of COD was achieved by FS in 250 min. 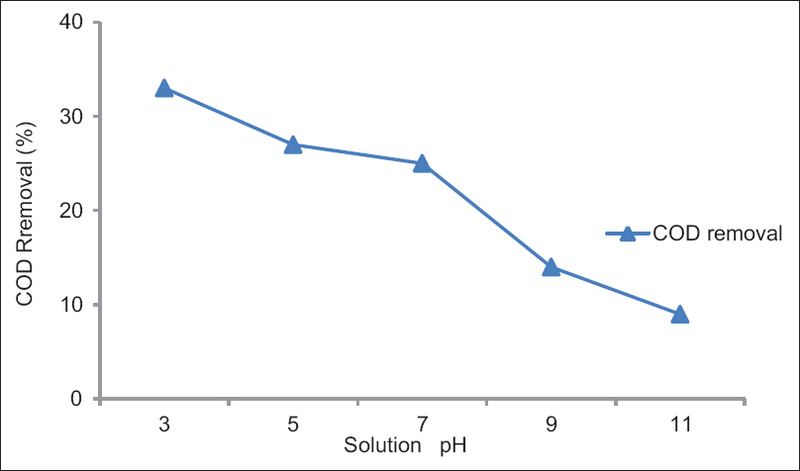 Degradation of compost leachate was investigated at different ultrasonic powers (100, 120, and 150 w), solution pH 9, ferrous sulfate dosage of 8 mmol, and 180 min sonication time. 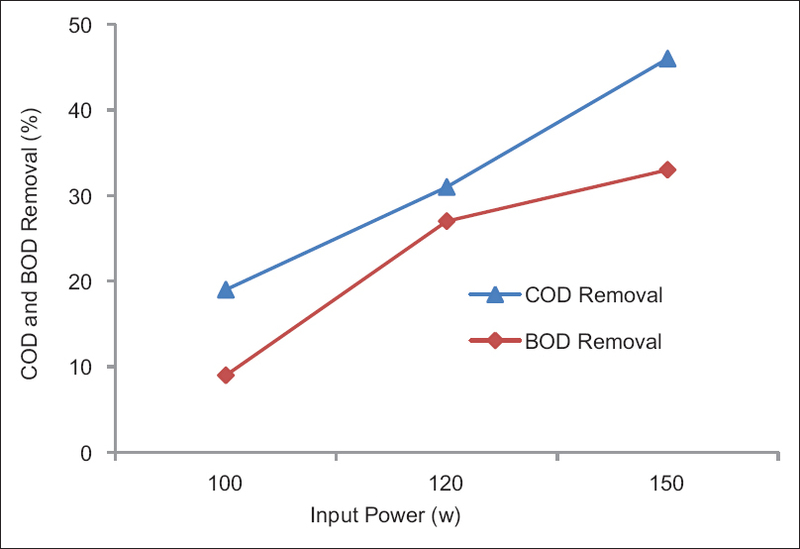 As shown in [Figure 4], COD and BOD removal increased by increasing of input powers. Approximately 46% of COD was removed at the power of 150 w.
Amin M, Ahmad Moazzam M. Advanced oxidation treatment of composting leachate of municipal solid waste by ozone-hydrogen peroxide. Int J Environ Health Eng 2014;3:21. Mojiri A, Aziz HA, Zaman NQ, Aziz SQ, Zahed MA. Powdered ZELIAC augmented sequencing batch reactors (SBR) process for co-treatment of landfill leachate and domestic wastewater. J Environ Manage 2014;139:1-4. Trujillo D, Font X, Sánchez A. Use of fenton reaction for the treatment of leachate from composting of different wastes. J Hazard Mater 2006;138:201-4. Brown K, Ghoshdastidar AJ, Hanmore J, Frazee J, Tong AZ. Membrane bioreactor technology: A novel approach to the treatment of compost leachate. Waste Manag 2013;33:2188-94. Abood AR, Bao J, Du J, Zheng D, Luo Y. Non-biodegradable landfill leachate treatment by combined process of agitation, coagulation, SBR and filtration. Waste Manag 2014;34:439-47. Silva AC, Dezotti M, Sant'Anna GL Jr. Treatment and detoxification of a sanitary landfill leachate. Chemosphere 2004;55:207-14. Sharma S, Buddhdev J, Patel M, Ruparelia JP. Studies on degradation of reactive red 135 dye in wastewater using ozone. Procedia Eng 2013;51:451-5. Shu Z, Lü Y, Huang J, Zhang W. Treatment of compost leachate by the combination of coagulation and membrane process. Chin J Chem Eng 2016;24:1369-74. Ribeiro AR, Nunes OC, Pereira MF, Silva AM. An overview on the advanced oxidation processes applied for the treatment of water pollutants defined in the recently launched directive 2013/39/EU. Environ Int 2015;75:33-51. Wang XK, Wei YC, Wang C, Guo WL, Wang JG, Jiang JX. Ultrasonic degradation of reactive brilliant red K-2BP in water with CCl 4 enhancement: Performance optimization and degradation mechanism. Sep Purif Technol 2011;81:69-76. Wang X, Yao Z, Wang J, Guo W, Li G. Degradation of reactive brilliant red in aqueous solution by ultrasonic cavitation. Ultrason Sonochem 2008;15:43-8. Mohapatra DP, Brar SK, Tyagi RD, Picard P, Surampalli RY. Ferro-sonication and partial ozonation pre-treatment and biotransformation of wastewater sludge for degradation of bisphenol A: Rheology studies. Chem Eng Sci 2012;81:20-7. Pourzamani H, Majd AM, Attar HM, Bina B. Natural organic matter degradation using combined process of ultrasonic and hydrogen peroxide treatment. Anu Inst Geociencias 2015 ;38:63-72. Bakhshoodeh R, Alavi N, Majlesi M, Paydary P. Compost leachate treatment by a pilot-scale subsurface horizontal flow constructed wetland. Ecol Eng 2017;105:7-14. Eaton AD, Clesceri LS, Rice EW, Greenberg AE, Franson MA. APHA: Standard Methods for the Examination of Water and Wastewater. Centennial Edition. Washington, DC: APHA, AWWA, WEF; 2005. Mohapatra DP, Brar SK, Tyagi RD, Surampalli RY. Parameter optimization of ferro-sonication pre-treatment process for degradation of bisphenol A and biodegradation from wastewater sludge using response surface model. J Hazard Mater 2011;189:100-7. Ertugay N, Acar FN. Removal of COD and color from direct blue 71 azo dye wastewater by Fenton's oxidation: Kinetic study. Arabian J Chem 2017;10:1158-63. Vilar A, Eiroa M, Kennes C, Veiga MC. Optimization of the landfill leachate treatment by the Fenton process. Water Environ J 2013;27:120-6. Ahmadian M, Reshadat S, Yousefi N, Mirhossieni SH, Zare MR, Ghasemi SR, et al. Municipal leachate treatment by fenton process: Effect of some variable and kinetics. J Environ Public Health 2013;2013:169682. Nuengmatcha P, Chanthai S, Mahachai R, Oh WC. Sonocatalytic performance of ZnO/graphene/TiO 2 nanocomposite for degradation of dye pollutants (methylene blue, texbrite BAC-L, texbrite BBU-L and texbrite NFW-L) under ultrasonic irradiation. Dyes Pigments 2016;134:487-97. Shirsath SR, Patil AP, Patil R, Naik JB, Gogate PR, Sonawane SH, et al. Removal of brilliant green from wastewater using conventional and ultrasonically prepared poly (acrylic acid) hydrogel loaded with kaolin clay: A comparative study. Ultrason Sonochem 2013;20:914-23. Xiong SF, Yin ZL, Yuan ZF, Yan WB, Yang WY, Liu JJ, et al. Dual-frequency (20/40 kHz) ultrasonic assisted photocatalysis for degradation of methylene blue effluent: Synergistic effect and kinetic study. Ultrason Sonochem 2012;19:756-61. Mehrdad A, Hashemzadeh R. Ultrasonic degradation of rhodamine B in the presence of hydrogen peroxide and some metal oxide. Ultrason Sonochem 2010;17:168-72.